Recently, my family and I moved to a new house, and one of the lovely things about our new house is hearing all the birds chirping, and watching them play in a big bottlebrush tree (a “callistemon”) out the back. One evening as my husband got home, he told me there was a little bird on the front steps. We went out to have a look. It looked like a baby. Perhaps a magpie? No, my facebook friends assured me later, after I posted a photo. 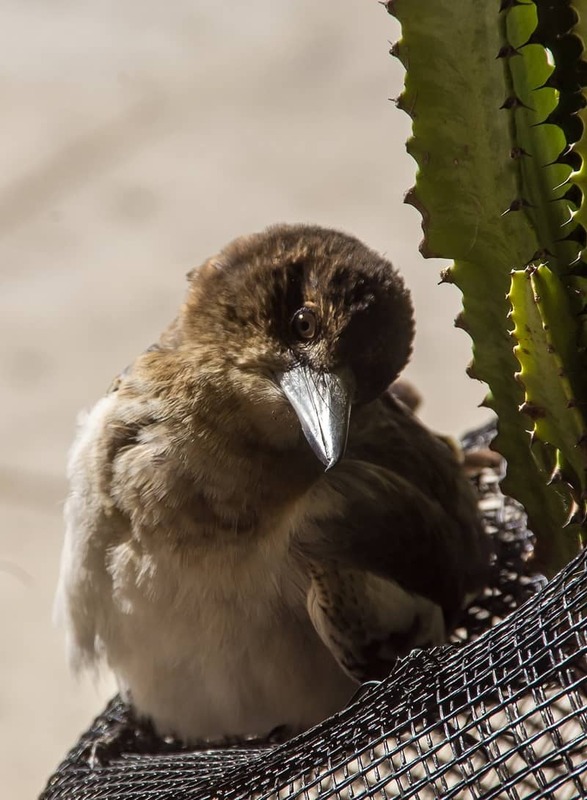 It was a baby butcherbird. How wonderful and mysterious a moment it felt, when a little wild creature came to sit on our front step. But what to do? My husband quickly looked up on the internet who to call if you discover wildlife that may be lost or injured. He called the RSPCA to find out what to do. They said to wait an hour in case its mum came for it, and to take it to the nearest vet if its mum didn’t come by then. Well its mum hadn’t come an hour later, so we found a nice box that was around after moving house, carefully coaxed the bird in, and took it to the vet. I called the next day to see how it was, but the vet let me know that this little one didn’t make it and it had had to be euthanised. Possibly a cat had harmed it, the busy vet I spoke to pondered. No obvious injury had been apparent to me, but even a tiny scratch from a cat wound can be deadly due to the bacteria in cats’ mouths. This fleeting meeting and adventure with our little wild bird got me thinking: How I could better look after wildlife in future? Could I become an animal carer? What could we add to our garden to make it friendlier to native birds and wildlife? How could I honour this little bird? If you would like to consider becoming a wildlife carer, there are places you can attend courses. 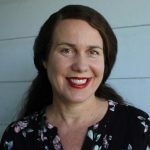 In South East Queensland, one of the best-known course providers is Wildcare, and Karen from Wildcare kindly answered some of my burning questions. Before choosing which kind of animal you would like to become a carer for, you first need to consider your other work and family commitments. Karen said many wildlife volunteers worked full or part time. “Your work and family commitments will dictate what species would be best suited to your lifestyle. “Our Rehab Fact Sheets on our website (e.g. 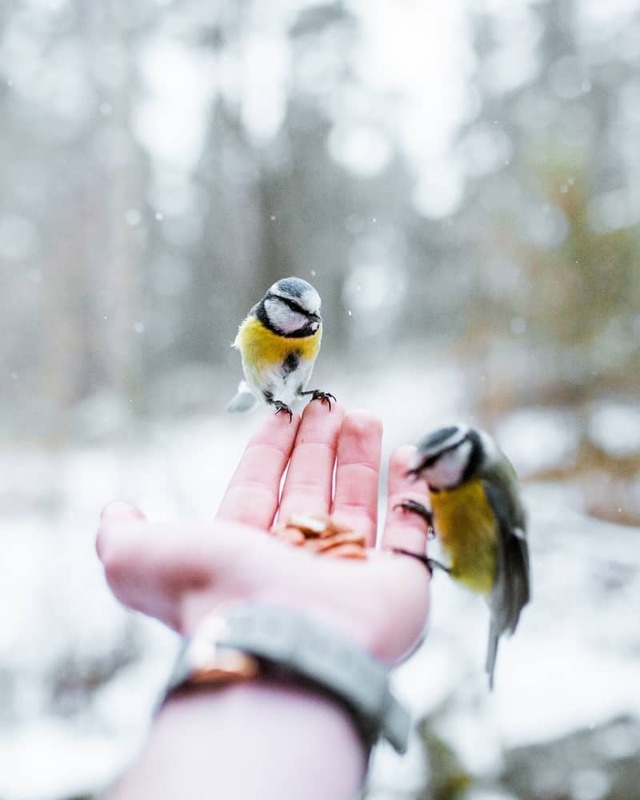 Caring for Birds) provide a bit of an insight into this for each species. When it comes to the time and effort it takes to look after wildlife, Karen said it depends on the species. So how do you become a wildlife carer? Karen said Wildcare’s training approach involved completing initial training (Orientation and Rescue and First Aid for Wildlife). That then enables you to start to undertake wildlife rescues. “If you wish to care for birds, you have to attend the bird training courses,” she said. Wildcare’s website includes an education calendar with a table that outlines the courses you need to complete for each species. It’s worth checking out as it covers the scheduling of the workshops, which will help you ascertain your ability to attend the workshops. To find out the when/where/cost of Wildcare courses, check out their education calendar or find a similar course where you live through WIRES (NSW Wildlife Information, Rescue and Education Service Inc.) in New South Wales, through the Parks and Wildlife Service in Western Australia, or through Wildlife Victoria). Now you may not feel ready or able to become a wildlife carer, but there is plenty that we can do in our own homes to make them safer and more appealing to wildlife. 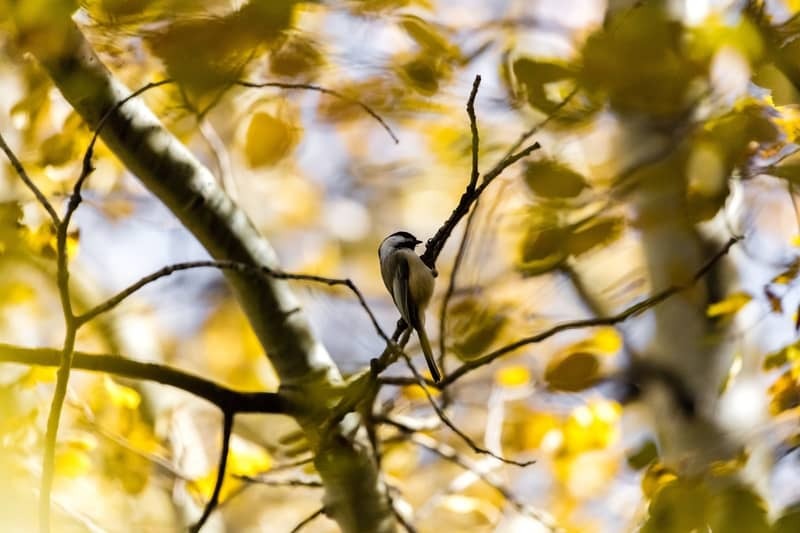 Wildcare provide several brochures to guide you on ways to make your garden appealing to wildlife, which can also be found on their Carers Resources page. From flowers that produce nectar to attract butterflies (caterpillars may eat your plants, but healthy plants will recover) to hollows and nesting boxes for various species, Wildcare and other wildlife organisations recommend providing a wildlife friendly garden, with shelter, sources of water and native plants. Native plants can provide natural food sources for native animals, which is considered much better than providing food such as, sugar, honey, seed or commercially bought fruit, which can lead to dietary deficiencies and poor health. Wildcare also recommend providing water for birds in birdbaths, preferably above the ground to protect from predators. But you need to disinfect them regularly (as you do any water provided to wildlife) to reduce the spread of diseases. The Spruce.com recommends using a scrubbing brush and one part chlorine bleach to 9 parts water to clean your birdbath, two to three times a week. However the Drs Foster and Smith brand recommends simple detergent or their Microbe Lift Birdbath cleaner. 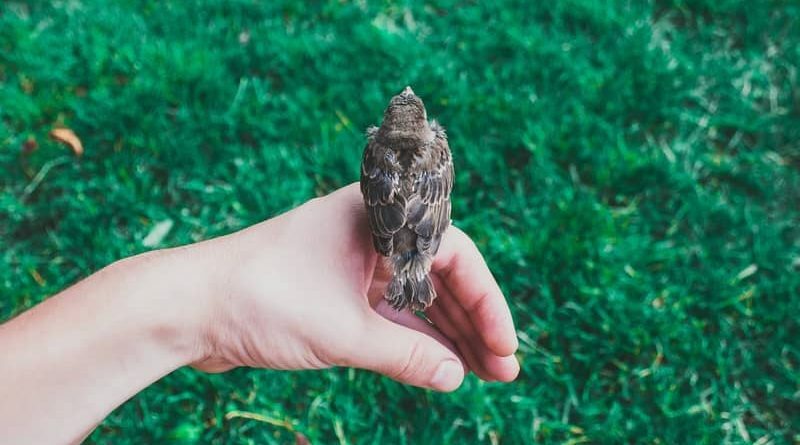 If you find an injured or lost native animal, the place to call to find out where to take it or to get support on how to look after it differs from state to state. The RSPCA’s new knowledgebase lists the relevant places to contact in each state about injured wildlife. This list will connect you with the right people in an animal emergency. However, there may be other places to obtain advice such as BIRO (Birds Injured Rehabilitated Orphaned) for birds. When an animal may be injured, it usually has to be seen by a vet. When we called the RSPCA, they were able to let us know which vets were open during the night, that were happy to take wildlife. Karen said most vets accept wildlife free of charge and they should assess it for any injuries and then triage its treatment [triaging is the prioritisation of injuries to decide the order of treatment, especially important when there are a lot of patients]. “They may choose to euthanise it if it is severely injured and is unable to be treated. They may provide pain relief and antibiotics until it can be transferred to a wildlife volunteer or a wildlife hospital,” she said. It’s worth noting that there is no obligation on vets to inform the member of the public what the outcome of the wildlife they accepted was, though they may choose to tell you if you ask. Vets are not obliged to accept wildlife into their clinics. Karen said they care for wildlife on a pro-bono basis and they keep very limited records of wildlife admitted. “The obligation on them to inform members of the public of the outcome of the animal, is one for each clinic to decide. “Many members of the public cannot understand why an animal would be euthanised because they don’t understand the nature of a wild animal and they are not accepting that sometimes we cannot save them – be that a vet, wildlife hospital or wildlife volunteer,” she said. While our little butcherbird didn’t make it, I’ve heard of lots of wonderful and inspiring stories of little creatures being nurtured back to health. 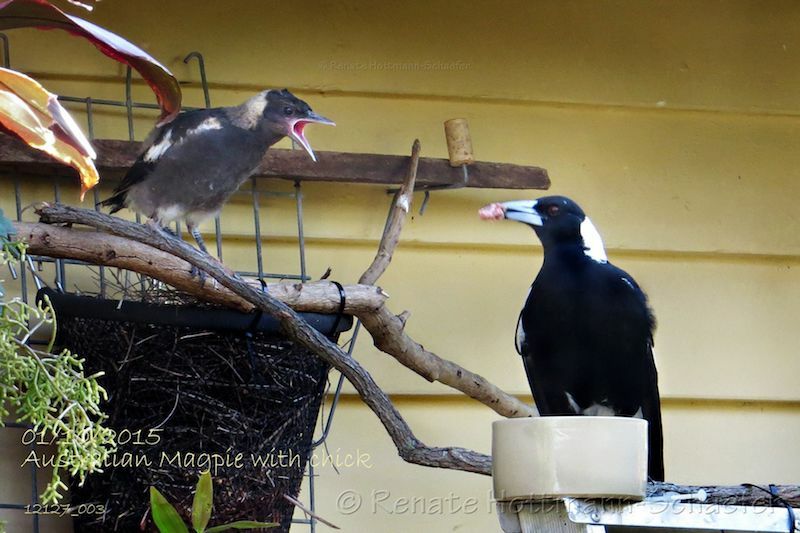 Wildlife carer Renata shared a story of a baby magpie she named Bruno that she nursed back to health. Its father Otto finally came to feed it again after five days of her care, and Bruno was back in the nest a couple of days later. Photo Source: Renate Hottmann-Schaefer, used with permission. My friend Lawrence shared a story about rescuing a crow that had become tangled in fishing line, suspended above a creek near his house. He managed to rescue it, breaking the fishing line with his teeth. This was not without a few bloody scratches and a chorus of crows investigating his every move. Not to be tried at home kids! You can catch some serious diseases from birds if you aren’t careful! He was then able to take it to his local vet, where a fishing lure was successfully removed from its wing. The crow was given to a carer who would release it back to the area a couple of weeks later. An acquaintance let me know that the vet we took the butcherbird to was highly reputable and would only have euthanised if it was absolutely necessary. So at least I know that we, and the vet, did all we could, given the situation, and that I am now equipped with better knowledge of how to keep our garden wildlife friendly, how to look after wildlife in an emergency, and how to learn to become a wildlife carer when I feel like I have the time.